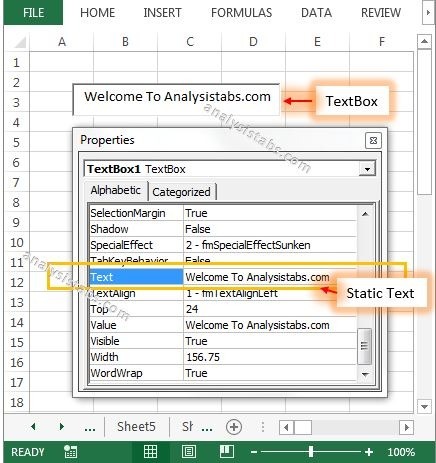 TextBox is used to display data, edit data, etc in the rectangular box. 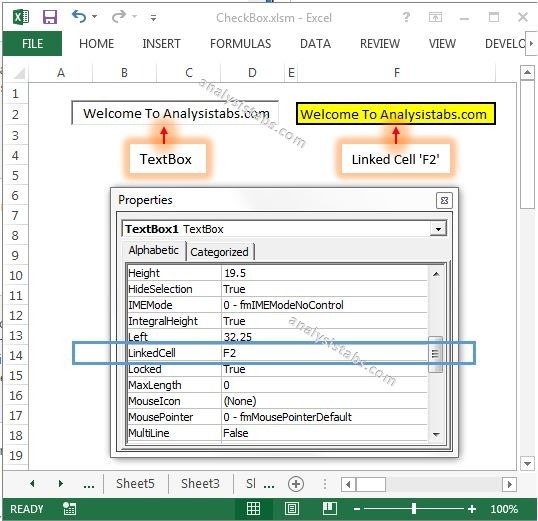 The Textbox can be linked to a Worksheet Cell. The TextBox can have static and dynamic value. When data or text is static in the TextBox field, it represents the read only information. It can be used on the WorkSheet or UserForm. You can see how it works and more details about ActiveX TextBox Control on the UserForm or Worksheet in the following chapter. Please find more details about VBA ActiveX TextBox Control on the Worksheet. 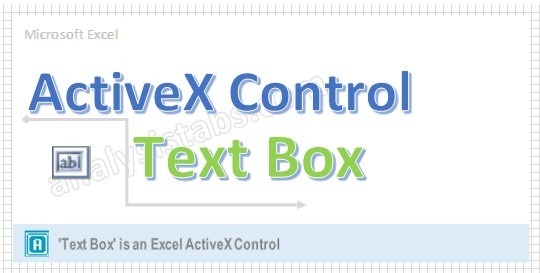 Click on the TextBox_control from the ActiveX Controls group. Right click on the TextBox_control, before that Design Mode should be turned ON. On the left side find ‘Text’ from the available properties of the control. You can link the Text box to a Worksheet cell. Right click on Text box and select properties. On the left side find ‘LinkedCell’ from the available properties of a Text Box. On the right side mention the linked cell as ‘F2’. Please find the below screen shot for the same. Like this you can add number of TextBox controls on the Worksheet according to your requirement. Please find the below code, it will show you how to delete or remove the control on the worksheet. In the below example, its deleting the Text Box named ‘TextBox1’ which is on the worksheet named ‘Sheet11’. Where Delete is the property of Shape object.